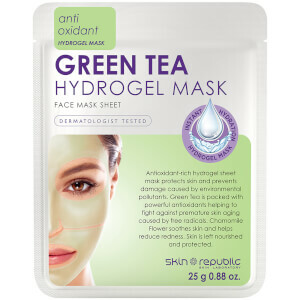 Safeguard your skin with the Skin Republic Green Tea Hydrogel Face Sheet Mask, a protective sheet mask infused with a hydrating and antioxidant-rich serum. Utilising next generation hydrogel mask technology for close and continuous contact, the essence-infused face mask adheres comfortably like a second skin, allowing optimum absorption of ingredients for maximum efficacy. Protecting skin against environmental damage, the face mask contains Green Tea for its powerful antioxidant properties; it helps to prevent signs of premature ageing caused by pollutants and external aggressors. Delivering instant hydration, the moisture-enhancing mask nourishes and protects while soothing and minimising redness with Chamomile Flower.